I’ve been thinking, rather unfashionably, about port. Rather unseasonably too, perhaps, as we move into spring and most people seem to associate drinking fortified wines (if they drink them at all) with winter. Not me – when willing to confront the alcohol and the calories, I’m happy to drink it all the year round, especially one of the more modest examples poured over ice-cream in summer. My port ponderings (forgive my avoiding quotation marks for the local stuff; let’s take it for granted we all know the rules and the difference) were prompted by stumbling on some oldish articles from the defunct Grape magazine, when I was looking for something quite different. First, a 2002 account of a Grape tasting conducted and written-up by the late Tony Mossop, eminent wine journalist, judge, and port-maker at his tiny Calitzdorp property, Axe Hill – and also father of Miles Mossop, not the least of Tony’s contributions to Cape wine. Secondly, tantalising excerpts from what was clearly a heated debate in 2007 about a Wine magazine port tasting (the rest of the debate is lost in cyberspace). A decade and especially two decades back, port seemed much more important to South African wine than now. In fact, if you’d wondered in the mid-late 90s about the most exciting category in Cape wine, it’s bizarrely certain that port would have been a leading contender. By the early 1990s there had been signs from Calitzdorp of a shift from the prevalent model of single-variety wines, a lot of sweetness and fairly modest alcohol levels, towards something more approaching the classic Douro style. But it was really a Stellenbosch wine, JP Bredell Reserve Port 1991, that announced the port revolution – and in fact, long before, Overgaauw had been pioneers of using traditional varieties. 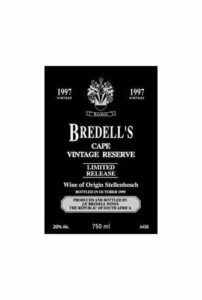 The 1991 was Anton Bredell’s maiden release – though JP Bredell had long been one of the largest private producers of port in the world, making it for KWV to market. A blend of tinta barroca and souzão, with just 100 g/l sugar and 19.3% alcohol, it received enthusiasm and 4.5 stars in Platter, and things really started moving. Tony Mossop, for example, was soon prompted to acquire Axe Hill and start planting port varieties in 1993, and his traditionally made (foot-trodden in lagares), dry-finishing, tannic first release was 1997. It’s reliance on touriga nacional, the finest of the port grapes, was as important as its style. Higher alcohols and less sugar were becoming more common now. Bredell’s was certainly my favourite of the ports. And then (it seems to be a complicated story involving land and family) it suddenly disappeared – the 2007 Cape Vintage Reserve was the last I know of. If there hadn’t by then been so much excitement about other categories of Cape wine, its absence would have been mourned more. I hear, however, that from a new base in the Klein Karoo’s Langeberg-Garcia ward JP Bredell is being reinvigorated. Whether there’ll be more ports forthcoming I don’t know, but apparently a few of the older ports are being re-released, including the 2007, and a 20-year-old Cape Tawny on the way. Worth keeping a look out for. It is good to see Tim is so enthusiastic about Cape Port. After producing the SA Champion Port (SAYWS) in 1986 and 1987 the Nel family of Boplaas visited the Douro Valley and produced the first drier style Port (95g/l and 19%) in 1989. This Port was rated the best in SA by Peter Devereau and was rated as one of the top 150 wines in the world by “Guide al vini de mando.” In 1993 the South African Port Producers Association was formed and started to promote drier style Ports made from Port cultivars. Boplaas was the second producer to plant Touriga Nacional (after Overgaauw) in 1993. Tony was a good friend and our families spent a lot of evenings sipping good Port and other wines. Thanks Tim – for the delicious musings! On average (beginning 2000) Axe Hill vintage ports – yes I am afraid we still use the word – some unfinished business mind you – are sub 92g/l sugar and always lean towards the Douro “drier” style. And as you allude to, we only use Portuguese varieties. I have looked for the the exact sugar for the earlier Axe Hill vintages – the first record I have available now is the 2000 vintage – which came in at 97g/l. Whilst we acknowledge other “portable” cultivars, the Cape Port Producers Association is active in promoting the use, where possible of traditional Portuguese varieties for port-style wines. As you will be aware, we also seek to promote the development of still wines made from Portuguese varieties by means of our annual Challenge where an independent panel chooses the Top Ten of these wines! Finally, a day without port is not worth a thought – rain or shine, hot or cold, braai or haute cuisine – all comes to naught – so please pass the port! Thank you Tim, for highlighting how special Cape Port was, is and can be for South African wine. We have always been great friends with the Nel family of Boplaas and enjoyed many years of building on the passion of great Cape Port together. Us Bredells have always had a deep love and passion for Port (not only making it, but also consuming). Its something that has been with us for generations and will stay for generations to come. We also agree that Port is not just for that cold winter eves, we see it as a more approachable wine that always bring joyful harmony to any social gathering. The past few years JP Bredell wines have undergone a collosal dormancy with a shift towards a more distant lesser known wine region, Langeberg-Garcia. However, wine and viticulture run too thick in our blood. It has been tough, but now we start to slowly rebuild from our new base in the Southern Klein Karoo. With limited resources and just the basics at hand for now, 2017 will see our first new vintage (using an old sheep shering shed transformed into a small boutique scale facility). We will certainly produce some Port together with more mediteranean varieties suited for our new region. Some new vine roots are currently exploring the dry schist and slate soils of this ancient and extreme terroir as well. Wheter for this generation or the next. 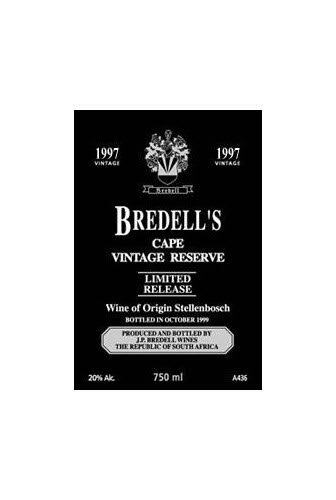 JP Bredell have always and will always be producing some Port….somewhere sometime, either way Cheers to Cape Port!